In an editorial published by The Washington Post on Sunday, Apple CEO Tim Cook comes down hard on a spate of U.S. legislation he believes enables discrimination under the guise of religious freedom. After posting a series of tweets on Friday speaking out against controversial laws in Indiana and Arkansas protecting "religious freedom," Cook went a step further and penned a scathing editorial condemning such legislation as "designed to enshrine discrimination in state law." "Something very dangerous happening in states across the country," Cook writes, referring to a flood of new legislation some believe equates to government protection for discriminatory practices. Specifically, Cook takes issue with recent bills that institutionalize the right to penalize homosexuals based on established "religious freedoms." As applied to Arkansas, Indiana and multiple other states, these laws are openly biased. Baptized in a Baptist church, Cook says faith played an important role in his development, adding that he continues to be a proponent of religious freedom. However, he was never taught that religion should be used as an excuse for discrimination. For Cook, issues of discrimination harken back to his early life in Alabama during the 1960s and 1970s, when America's struggle with racial equality reached its boiling point. "Discrimination isn't something that's easy to oppose," Cook writes. "It doesn't always stare you in the face. It moves in the shadows. And sometimes it shrouds itself within the very laws meant to protect us." Cook, who wields considerable clout as CEO of the world's largest company, said he writes on behalf of Apple in condemning discriminatory legislation, adding America's business community has long recognized that "discrimination, in all its forms, is bad for business." 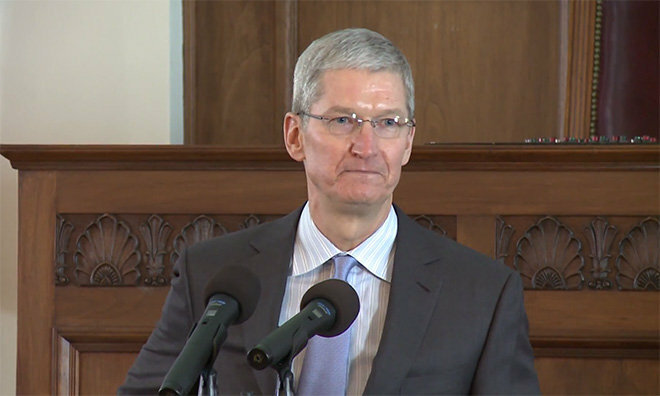 "Our message, to people around the country and around the world, is this: Apple is open. Open to everyone, regardless of where they come from, what they look like, how they worship or who they love," Cook writes. "Regardless of what the law might allow in Indiana or Arkansas, we will never tolerate discrimination." In speaking out so publicly, Cook hopes others will stand up against similar legislation, arguing bills currently under consideration will eventually hurt job growth.